Difficult but not impossible is the way Labor Commissioner Michael Thurmond describes the outlook for Georgians seeking work in 2009, even though the current downturn is expected to continue for many months. The numbers are sobering. The state shed some 70,000 jobs between February and August of 2008; initial unemployment claims in October 2008 were up 57 percent from the previous October, reaching 72,627. The unemployment rate, seasonally adjusted, rose from 4.5 percent in September 2007 to 6.5 percent in September 2008. It reached 7 percent in October. Among them, the new Kia plant set to open this year in west Georgia, military base expansions at Fort Benning in Columbus and Fort Stewart near Hinesville and especially the state’s thriving healthcare industry. 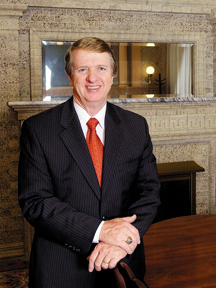 Humphreys predicts a long, slow recovery starting in the third quarter of 2009 and sees job losses continuing through June. For workers outside healthcare who are job-hunting in such a climate, “They’ll be looking for diamonds in the desert,” he says. Thurmond believes looking ahead a few years provides more reason for optimism. It won’t be open in time for 2009 jobseekers, but a Volkswagen plant in Chattanooga will provide opportunities for north Georgians. The alternative energy industry offers long-term potential as Georgia Tech leads the way in solar energy and companies statewide turn everything from pine trees to peanut shells into fuel. The education and health services sector of the state’s economy added about 3,600 jobs between February and October 2008, and the long-term outlook is even more encouraging. “Because of the growing number of older people, you can’t help but have people flowing into those [healthcare] careers,” says William “Joey” Smith, who’s an assistant professor of economics at the University of West Georgia in Carrollton. Smith concentrates on five counties in his forecast: Haralson, Carroll, Douglas, Coweta and Paulding. For his immediate geographic area, Smith is most enthusiastic about healthcare. The field provides opportunities for professionals with all levels of education, from technicians to physicians. Throughout the state, registered nurses are retiring, creating even more openings, he says. West Georgia recently upgraded its nursing program from a Department of Nursing to a School of Nursing and is stepping up efforts to feed qualified nurses to hospitals and doctor’s offices in the area. The Technical College System of Georgia – the state’s network of 33 technical colleges in the process of consolidating to 26 – plays a major role in educating healthcare workers. About 36 percent of students enrolled in Georgia’s technical college system are pursuing careers in healthcare, says Ray Perren, assistant commissioner of the technical college system. More than 51,000 students were enrolled in healthcare programs statewide last fiscal year. Another 9,600 were on waiting lists for healthcare programs in communities where demand for classes outstrips supply. Upon graduation, Perren says, almost 99 percent of graduates report landing jobs or continuing their education. The most popular specialty is healthcare assistant, which trains people for entry-level work in hospitals, doctors’ offices, assisted living facilities and home settings. Other programs include practical nursing, dental assisting, surgical technology and office technology. Central Georgia and southwest Georgia technical schools have gerontology programs, which train students to work with aging citizens. At Gwinnett Technical College, familiar healthcare programs such as radiologic technology and nursing have competitive admissions policies because of the large number of applicants. Meanwhile, lesser known programs have seats available as well as abundant job opportunities, says Jan McClure, division director of health services at Gwinnett Tech. For example, the one-year program for dental lab technicians offers graduates the chance to make bridges, braces and crowns. “Not everyone wants to be sitting next to a patient in a chair,” McClure says, adding that dental lab work appeals to those who are good with their hands and have an artistic flair. Other healthcare programs at Gwin-nett Tech include respiratory care, which involves working in a hospital setting, managing respirators and ventilators, and emergency medical technician. Some diploma programs can be completed in a year, while a degree program takes two to three years to complete. Certificates may be obtained in just two or three quarters. “Anybody who graduates from one of these programs can go out and get a position in their field,” McClure says. The state’s automotive industry got a much-needed jolt when Kia Motors Corp. announced plans to build a billion-dollar plant in West Point. Gov. Sonny Perdue has called the Kia plant “the largest single economic development announcement in the history of our state.” The assembly plant, the South Korea-based company’s first in the United States, will produce some 300,000 vehicles a year. Scheduled to open later this year, the plant is expected to create more than 5,000 jobs directly, along with positions related to business development in the surrounding area. Kia has received more than 43,000 applications, and some job offers are already being extended. Kia cars are smaller and affordable, he notes. Though automotive sales are in decline, opportunities in automotive repairs remain steady. In the technical college system, almost 4,200 students were enrolled last year in programs such as auto technician repair, automotive technology and automotive fundamentals. Graduates can move into entry-level positions in independent shops, dealerships and chain stores, says Steve Conway, division director of automotive technologies at Gwinnett Tech, which has about 140 students in its automotive program. People don’t always think of military bases as sources of jobs for civilians, but the expansion of Fort Benning in Columbus as part of the Base Realign-ment and Closure Commision’s 2005 decision is expected to bring 11,000 new jobs to the region, says Mike Gaymon, president of the Greater Columbus Chamber of Commerce. For example, Alexander Construction, a local company, won a $19 million contract for the interchange at U.S. 27 and I-185. Specialized Services Inc. received a $100 million contract to provide concrete to Fort Benning, Gaymon says. Over the next few years, the expansion will create jobs in areas such as information technology, large vehicle maintenance and administrative support skills. Education jobs also will be created as the school-age population grows by 6,800, according to chamber estimates. “This time next year you’ll start to see the big movement in troops,” Gaymon says. The expansion is expected to bring more than 11,400 military personnel, contractors and government civilians, along with 16,700 spouses and children. Such growth will expand job opportunities in the service sector between now and 2012, he says. At Fort Stewart in southwest Georgia, a fifth brigade is scheduled to start arriving in late 2010, with ultimate plans for an additional 4,000 to 5,000 soldiers on the base. The brigade will add as many as 12,000 men, women and children to the community, says Kenny Smiley, executive director of the Liberty County Chamber of Commerce. Land clearing to prepare for the fifth brigade will begin in April, he says. In cooperation with the Hinesville Down-town Development Authority, the chamber is bringing together resources to recruit new retail businesses and franchises to support the growth, which will bring civilian jobs to the area. So-called green jobs get a lot of buzz, but experts offer mixed assessments of whether they represent potential paychecks for Georgians in the short-term. At Georgia State University, Rajeev Dhawan, director of the Economic Forecasting Center at the Robinson College of Business and an associate professor of managerial sciences, predicts that alternative energy and biotechnology, while not big enough to compensate for losses in the big picture, may still offer some positions. For other so-called green jobs, the openings could be scarce in 2009, when investment capital is limited. “The issue would be, are people willing to pay for the green movement when the economy is in a downturn,” he says. UGA’s Humphreys thinks the credit crunch might slow down companies looking to develop new fuels. Green is especially enthusiastic about solar energy. She points to Suniva, a solar company, recently opened in Norcross, founded by Ajeet Rohatgi, a professor at Georgia Tech and a premier authority on solar power. Green believes other companies can do as Suniva did and raise money through investors who are looking for innovation. “Venture capital firms still have funding,” she says. For those seeking immediate employment, Georgia State’s Dhawan foresees opportunities for professionals specializing in bankruptcy, collections and management of “distressed property.” Within finance, banks might not need loan officers, but they may need someone to manage their vacant properties, he says. Another bet might be cell phone and wireless technology, a narrow but growing field. Dhawan agrees with his colleagues that the downturn will last longer than normal, but he says it won’t be as deep as the recession in the 1980s. UGA’s Jeffrey Humphreys cautions that even education jobs will be tight in 2009. With state and local revenues down, jobs paid with tax dollars, which are often secure during downturns, will not be this time around, he says. He’s also concerned about IT, which is holding its own so far, but may struggle because companies rely on capital and credit that might not be available. With a base of 4 million jobs statewide, IT accounts for only about 120,000 jobs in Georgia. Some technology companies such as those marketing free internet services could thrive, he says. At Kennesaw State University, Don Sabbarese, finance professor and director of the Econometric Center at the Coles College of Business, encourages students to look beyond 2009 in choosing their career. For the next year or two, graduates will be competing with experienced professionals who have been downsized for positions. “The banking industry is losing jobs right and left,” he says. But that will change, and when it does, those with business degrees will be employable. Accounting majors, especially, will find jobs, even in tough times. “Every time we change laws, it creates jobs in accounting,” he says.